Snakes entwined on his staff protect Mercury, messenger of the Roman gods. With a little imagination, you can visualize the snakes entwined in Mercurys symbol, seen below. Mercury is the son of Jupiter and Maia, one of the Pleiades. Mercury is comparable to the Greek god Hermes; both are considered messengers of the gods. 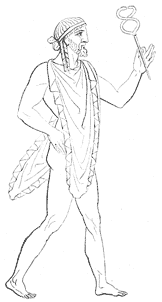 Naturally, Mercury/Hermes is thought to be very swift--this is proven by his winged sandals in drawings. Mercury's name is related to the Latin word merx, which means merchandise, mercari, or trade, and merces, or wages. He is therefore the god of Commerce and Trade; however, he is also the god of Thieves, and Travel, since many merchants did not stay in one place to vend their wares. Mercury, the planet, has been known since at least the time of the Sumerians (3rd millennium BC). It was given two names by the Greeks: Apollo for its apparition as a morning star and Hermes as an evening star; however, Greek astronomers knew that the two names referred to the same body. Heraclitus even believed that Mercury and Venus orbit the Sun, not the Earth; this idea was not commonly held as true at the time. In ancient times, messages from one ruler to another or between armies were carried by heralds who had to be treated with respect and were not to be harmed. These heralds carried a special staff as the sign of their position -- a caduceus -- and Hermes carried such a staff. Supposedly, because Hermes moved so quickly, the staff, as well as his cap and sandals, had wings. Of all the planets in our solar system, the one that moves most quickly against the background of the stars was naturally named after the swift-footed Hermes. Because the Romans identified their own god of commerce, Mercury, with Hermes, we now know the planet as Mercury. Hermes also escorted the souls of the departed to Hades; as that character, he was called Psychopompus. Under the name of Oneicopompus, he was regarded as the lord of dreams and visions. His festival was celebrated on May 15, at which time merchants sprinkled themselves and their wares with holy water to insure large profits. Mercury is the source of words such as market, merchandise, merchant, and merciful. In astro-mythology, the messenger is the intermediary between the four elements, air, earth, fire, water, and the phenomena produced by them. Innermost of the planets, Mercury swoops to within 46,000,000 kilometers of the Sun, then slows down as it swings out to some 70,000,000 km away. The spacecraft Mariner 10 sent back our first detailed pictures of Mercurys Moon-like surface in early 1974. One of the spacecrafts most important findings was that Mercury has a magnetic field strong enough to turn aside the mighty solar winds. Another finding was that Mercurys surface is covered with craters that were probably made early in its history, when rocky meteorites up to several kilometers across crashed into the young planet. Until recently, people thought Mercury was the smallest planet; however, new observbations and measurements indicate that Pluto is smaller. Mercurys orbit is more elliptical than the path of any other planet except Pluto. If orbits were racetracks, speedy Mercury would leave the other planets behind. It zips along at about one and a half times the speed of Earth. For all its speed, Mercurys spin is slow; so slow that six Earth months go by before the Sun appears from one high noon to the next high noon. Sign up for free to access more Greek gods resources like . Wyzant Resources features blogs, videos, lessons, and more about Greek gods and over 250 other subjects. Stop struggling and start learning today with thousands of free resources! Tech related to mythology Who is the god of speed Who helps Odysseus in Phaeacia? How does the portrayal of Theseus shift and evolve in Greek literature?